T hough not as important as it once was, print marketing is still a critical ingredient in your marketing strategy. Brochures, product catalogs, direct mail, product packaging and trade journal advertising play a vital role in communicating your brand and your products and services to new and existing customers. Keeping a consistent theme through all of your print and online marketing is key to developing your company's brand image.We tailor each design to reflect the company and it's brand. Owl Watch's print design team can handle all aspects of your print design including the print production. We are full service from concept to printing. Before Al Gore invented the internet, our principals were hard at work in the print industry. That experience gives us the ability to manage your offline and online marketing to maximize your budget and produce results. 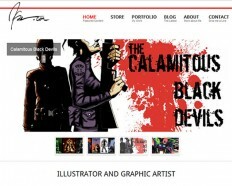 Joseph Schmalke is the artist and writer of the Calamitous Black Devils and founder of Newboy Comix. His work has appeared in Wicked Hawt Magazine and art shows throughout the New England area. A lifelong lover of comic books and horror, he got his start working as a tattoo artist in New Orleans. He has worked as a freelance illustrator and graphic designer for almost ten years, creating comic strips, concert posters and album covers.